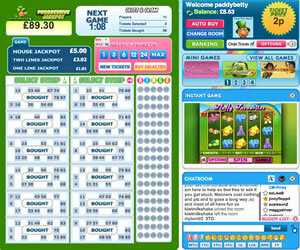 Towards the end of May 2014 Clover Bingo became the 17th online bingo brand to launch on the 15 Network. Land at the site for the first time and you’ll clearly see what the brand has been called Clover Bingo, although which came first, the name or the design? Only the operator knows! The site is owned by the same people who run Charity Bingo (another brand on the same network) and also run Two Little Fleas, a portal like ours. The home page is full of clichéd Irish icons like a leprechaun (who incidentally is ginger), a shamrock, a rainbow and a pot of gold. 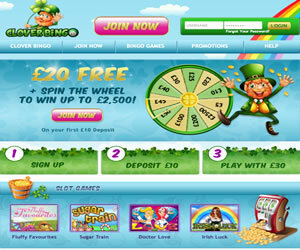 It is colourful and certainly uses a theme that fits will with the name Clover Bingo. The landing page promotes the welcome bonus, as is standard across the network, and shows a few of the instant win games that are available when you register to play. Talking of which, signing up to see if the luck of the Irish awaits you at Clover Bingo is pretty easy. It will take just a few moments of your time to register and be ready to play at the site. Unlike many brands online today, Clover do not ask for your financial details. These can be entered when and if you choose to make a deposit with the site. When registration is complete you are taken to the My Account or Player Area of the site. This is where you have a number of options including completing your online profile. There’s no real benefit in doing so, it just means other players at the site and across the network can have a nosey at any information you care to impart in this section. It is also here that you can check your Inbox from Clover Bingo and it is worthwhile keeping an eye on this. Often the brands on this network utilise this internal mailing system to send bonus codes and promotional information – a handy tool to have. 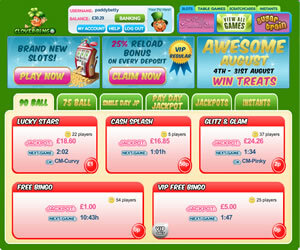 By clicking the ‘Play Now’ button you are taken straight to the main lobby where all the Clover Bingo wares are on show. It is here you can choose the room you wish to play in or the instant win game you wish to spin the reels on, it might be that you want to pre-buy for one of the jackpot games. The lobby shows an array of information about each room including the hosts name (if one is currently in the room), the ticket price, jackpot amount and number of players. The promotional schedule at Clover Bingo is not overly impressive, at least not at the time of launch. The usual suspects that we see at other brands on the same network are available but nothing new, exciting or exclusive was available at launch. It’s a brand that will appeal to those who love the 15 Network and Jumpman Gaming software but there is nothing different about it. You will find both 75 and 90 ball available at Clover Bingo. Unlike other sites available online today, the 75 ball offering is on pattern and not multi-line. 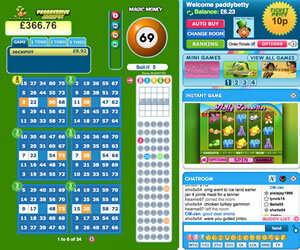 In addition to the bingo offerings you will find an impressive portfolio of instant win games available at the site. There are no specific wagering requirements from Clover Bingo you simply have to have wagering (not deposited) at least £30 with the site and have the minimum withdrawal amount of £30 in real cash funds available.